Welcome to ARC, this website tells the story of how the combined efforts of many caring Australians is helping create a more environmentally-aware packaging industry in this country. The Organisation of the Australian Recycled Cartonboard Campaign was founded to help make Packaged Goods Manufacturers aware of the environmental and marketing benefits of packaging their products in Australian Recycled Cartonboard. Through a national competition, the Campaign Office enlisted the help of thousands of Australian school students to design a logo, slogan and television commercial to help environmentally-concerned manufacturers and consumers identify packaging made from Australian Recycled Cartonboard. The response was overwhelming – from schools, students, manufacturers and consumers alike. Over the past five years, the ARC Campaign has been an outstanding success for the environment, and for everyone involved. Thanks to the efforts of a few enviromentally-concerned manufacturers and Australia’s largest paper recycler, Amcor, the ARC Campaign Office was created to help spread the word about Australian Recycled Cartonboard. The immediate dilemma, of course, was how to get Packaged Goods Manufacturers to change the way they thought about packaging. For years, many of these companies had believed that glossy new ‘virgin’ cartonboard was best, and recycled cartonboard had a kind of ’secondhand, second-rate’ image in their minds. Yet the research had shown that consumers were no longer thinking this way. Over 80% indicated that they would show a preference for products packaged in Australian Recycled Cartonboard…if they could find them. And that was a problem. With recent advances in recycling technology, the quality and appearance of recycled cartonboard had improved so much that it was almost impossible to tell the difference between recycled and virgin cartonboard anymore. What consumers needed was a symbol that readily identified Australian Recycled Cartonboard, so they could express their preference for environmentally-responsible packaging when they shopped. Only then would manufacturers become aware of the demand, and be motivated to satisfy it by using more of the kind of packaging that consumers wanted. The job at hand for the ARC Campaign Office was to set this cycle in motion by creating an eye-catching ARC symbol and enough publicity to make consumers aware of it. And who better to help out in the task than the group that has shown the greatest interest in cleaning up our environment – Australian school students. They are becoming more aware of the need to take care of the environment and they feel they can do something about reducing the amount of packaging in the waste stream. Most households have recycling bins now, and consumers are reading packs so they can differentiate between recyclable and general waste. More and more consumers are expecting manufacturers to help in their recycling efforts by packaging more products in recycled and recyclable materials. Consumers believe that cartonboard is easily recyclable. The research revealed that a significant number of consumers expressed a preference for recycled – as opposed to virgin – cartonboard, particularly if that cartonboard was made in Australia from Australian waste. “Made In Australia” and “Recycled” are packaging messages that Australians are reacting positively to. Long term Government efforts to get everyone more involved in environmental issues and the creation of Australian jobs are finally reaping dividends. This research showed conclusively that there was a new and growing need in the marketplace for a packaging material that was recycled and recyclable, and that was made in Australia. Surprisingly, that material already existed. All that was needed was somebody to make manufacturers and consumers aware of Australian Recycled Cartonboard and the environmental benefits of identifying and using it. The first national ARC schools competition was launched in 1995 to design an ARC logo, slogan and TV commercial. Thanks to the efforts of the schools and students, a number of well-known manufacturers signed up to package their products in Australian Recycled Cartonboard and to display the logo and slogan. Thanks to the media, consumers all over the country started to become more aware of the ARC symbol through wide coverage of the competition and regular free airing of the television commercial by the Seven Network. 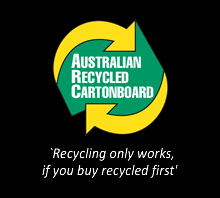 In successive years, the competition has focussed on assisting manufacturers who use Australian Recycled Cartonboard and display the ARC logo. To this end, students have developed promotions, public relations campaigns, community actions groups and much more, to help spread the word. In 1999 the Austereo Network lent their support to the competition, and aired a wide selection of student-produced jingles and poems on national radio. That year’s winning jingle gave birth to a new television commercial to promote Australian Recycled Cartonboard packaged products. The Seven Network has showed their support by regularly airing that commercial as a free community service announcement. We wish we had room to name the hundreds of thousands of students throughout Australia who have put so much time and effort into helping support the ARC Campaign. Without their hard work and creativity, none of this would have been possible. Their schools and teachers have been incredibly supportive too, and in many schools the ARC competition has become an annual assignment in subjects like Geography, Environmental Studies, Graphics, Art, Media Studies and English, to name a few. From the thousands of truly outstanding entries received by the ARC Campaign Office each year, only a few can be chosen as winners. Judging is always an extremely difficult task, and after much deliberation, the decisions are made. The first prize of $10,000, and other nominated prize categories are awarded at national presentation ceremonies each year on 5 June, World Environment Day. Most Packaged Goods Manufacturers are now aware of the ARC logo. And thanks to widespread promotion and media coverage, many more consumers are too. This symbol is their way of identifying packaging that is made in Australia from recycled inputs. “Products have personalities, and those manufacturers reluctant to use recycled material in their packages are facing a very real problem. Because more and more people are saying ‘Who is this product that I am bringing into my home? There are lots of products that do much the same job as this one does, who use recycled packaging. As the demand for Australian Recycled Cartonboard packaging continues to grow, helping reduce our wastestream and our need for natural resources, the excuses for continuing to package in virgin cartonboard are fast running out.